A child’s immune system is still developing and hence more vulnerable to infections. Using home remedies to treat infections is every mom’s first preference, but prevention is better than cure, isn’t it? That is why you should try feeding your child with superfoods that will help to build his immunity. This thinking is very much in line with the Indian Ayurvedic system which believes that in letting food itself be the medicine for the body. Before we talk about the foods that can boost your child’s immune system, it is essential for us to understand what the immune system is. Immune system is collectively the bunch of tissues, cells and organs that work towards protecting your body from the outside infections. There are millions of bacteria, parasites and fungi that can cause infection in a human body. They human body is made such that it can defend itself through its own immune system. It’s job is to fight with the infections and save the body from falling sick. Everyone is born with their own immune system. Some have it strong and some need to boost it. There are many ways to boost your immune system but it all starts with the right choice of food. Each food we eat has its own property and helps strengthen our immune system in different ways. It is important to include these foods in our child’s daily diet to make their body strong against unwanted infections. – Hippocrates, Father of Medicine. Bananas are a great source of vitamins, minerals and fibers and it contains inulin which is plant fiber and helps boost up the metabolism of the body. The raw bananas are very high in resistant starch which is prebiotic and should be included in the diet. Barley or “joh” as it is called in Hindi, is a grain which is high in Beta glucan, a prebiotic fiber. It is from the millet family of grains. It develops the friendly bacteria in the stomach and the digestive tract. It is also very rich in selenium which provided antioxidants and boosts up the immunity of the body. Onions are a tasty treat if used correctly. It enhances the flavor and gives color to the food prepared. It is high in flavonod quercetin that has antioxidant and anticancer properties. It also has antibiotic properties which benefits the cardiovascular system. 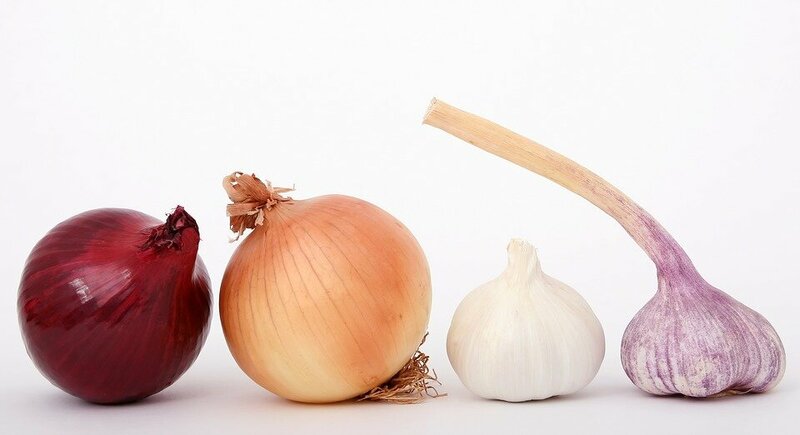 We can say that onions provide fuel for the good bacteria in the tummy and helps in improving the digestion which helps in boosting the immune system. Add them to omelettes, gravies or salads to ensure your little one gets some daily. Garlic is one of the healthiest herbs available which is has 11% fiber that comes from inulin and 6% from a sweet naturally occuring prebiotic called fructooligosaccharides (FOS). It helps the growth of the good bacteria and prevents bad bacteria to grow. It’s advisable to include garlic in most of the dishes one makes to enhance the goodness of the recipe. Due to its strong flavor, it takes time for the children to get used to its taste but with continues use children learn to like the flavor. Oats are recommended for a child’s health. It is a healthy grain that has high amount of beta glucan fiber and starch which offers antioxidant and anti inflammatory protection because of its phenolic acid. Oats helps the good bacteria to grow and strengthens the immune system. There is no question about it that good organic apples are among the most healthy fruit. An apple contains 50% fiber not to mention the delicious natural sweet taste to it. They are high in polyphenol antioxidant. The combined goodness of polyphenol and pectin in apples promotes the healthy bacteria and reduces the risk of cancer. Choose organic apples wherever possible, as EWG in its “dirty dozen” lists apples among the fruits most sprayed with pesticides. Wheat bran (choker) is the outer layer of the whole wheat grain with high contents of prebiotics. It has a unique fiber called arabinoxyan oligosaccharides (AXOS) which represents 66 to 69% of its fiber. It is known to work on the digestive problems like flatulence and abdominal pains. Including wheat bran in your child’s diet is a healthy option to increase the immune system. After the goodness of prebiotic oligosaccharides the other component which is essential for improving the immune system is Iron. Iron helps in the formation of hemoglobin, red blood cells that move oxygen in the body. Deficiency of Iron can harm the immune system and weakens the body. Inclusion of Iron rich goods in a child’s diet supports the immune system and helps them resist the bad bacteria in the body. According to the study more than 89 million children are anemic in India. The prevalence of anemia was 70% in children aged 6 months to 5 years, therefore it is important to keep the importance of iron in a kid’s diet. A lot of people question the amount of iron needed for a child to stay healthy. Toddlers in age group 1–3 years need 7 milligrams of iron each day. Kids aged 4–8 years need 10 milligrams while older kids ages 9–13 years need 8 milligrams per day. It is essential to feed your child iron rich food to strengthen the immune system. The following foods are rich in iron and should be included in the child’s diet on daily basis. Red meat especially liver is a rich source of iron. It is difficult to get kids eat liver due to its distinct flavor but you can try making meatballs and hamburgers for kids. You can also try making meat stock and mix it with other foods that your serve your child for iron intake. Egg yolks provide a high amount of iron. Serve boiled eggs or half boiled eggs for the goodness of iron in an egg yolk; you can try serving orange juice or two to three slices of orange to toddlers that helps in the absorption of iron. Tofu is a great source of iron if you are a vegetarian. Children love tofu for its smooth texture and taste. To include tofu in your child’s diet you can try serving it with various fruits and vegetables or cut into cubes and let your child enjoy it. Sweet potatoes are a healthy treat for children. It has a natural sweet taste and children love it. Half cup of sweet potato has around 2.5mg or iron and they are rich in vitamin c, which is essential to boost up the immune system. You can try making French fries from sweet potatoes, kids will never say no to it. Dry fruits like raisins, dates and apricots are high in iron. If you are feeding your child cereals or porridge in the morning add some dry fruits to it. Soaking the nuts overnight or for 30 minutes and then dry roasting them helps to ensure that they are better absorbed by the body. You can also grind them before adding dry fruits powder to porridges, shakes, smoothies and pancakes. Peanuts are a healthy treat for your kid and are rich in iron. It’s easy to serve peanuts to your children in the form of peanut butter and jelly sandwich. We know about the benefits of spinach from our favorite cartoon “Popeye the sailor man”. Show it to your kids; I am sure it will help them like the healthy vegetable. Spinach has huge amounts of non heme iron but if you mix it with vitamin C which helps in absorption of iron. Try making salads from green vegetables with tomatoes and top it with orange, lemon juice for best results. Prune is a fruit which has high contents of iron. A full cup of prune juice contains around 3 mg of iron which is the amount needed as a daily dose for a child. Prune juice is also high in sugar therefore it is necessary to limit the amount of the juice to one cup a day. Kidney beans are great source of Zinc for vegetarians. It helps in maintain the glucose level and provides energy for a long period. For best results boil or steam them with various vegetables. You can also try adding to your soups for your daily dose of zinc. A lot of people do not take flax seeds seriously as they are not commonly eaten in India but they are high in omega 3 and zinc. You can easily sprinkle them in soups and smoothies to give that extra crunch to your dish. We all know the goodness of watermelon especially in the summer heat but we throw away the seeds. The watermelon seeds are a high source of zinc as well as protein and magnesium. It’s easier to eat watermelon seeds if you dry them or toast them and include them in your daily diet. Now this is one think your children won’t mind eating. Serve them cocoa powder in milk and porridge with honey as an occasional treat. Processed chocolates are high in sugar so avoid them. Mushrooms are a yummy treat for children. They are high in calcium and zinc. Cook mushrooms in onions and tomatoes and the children will love it. You can also try to make mushroom tikkis. The best way to get enough vitamin D is sunlight as our bodies can create this vitamin itself. In India however, it gets a little difficult to get enough sunlight due to the harsh sun rays during the summer season and that is when we need vitamin D rich foods. Getting my son to play outside in the early morning sun whenever possible is one of the ways I ensure we as a family get our daily dose of Vitamin D.
If the same is not possible for you, a daily dose of vitamin D is a great source of boosting up a child’s immune system. Doctors recommend supplements of vitamin D for children but it’s essential to include foods as well that are high in vitamin D.
Avoid frozen or processed forms of fish and opt for fresh caught whenever possible. It is very important to include ample amount of Vitamin C to your child’s diet for strong immune system. Vitamin C helps the white blood cells to fight the infection in the body as well as help the body to absorb iron. Oranges, sweet lime, lemons, limes and just about any other cousins of these sour tasting fruits are power packed with Vitamin C.
Doesn’t the refreshing smell of freshly cut pineapple bring water to your mouth? It is a juicy fruit full of vitamin C. It helps in the digestion as it is high in fiber. Eating it whole is best but if you have to make a smoothie and top it with roasted watermelon seeds for that extra nutrition. I wish I could say that I have yet to meet a person who dislikes mangoes, but I cannot, because I’m married to one such unique person! 🙂 A mango contains around 122 mg of vitamin C. Cut them in pieces, make mango shakes or smoothies. Children love mangoes in every form. They can eat it raw, or you can fall back on any of these delicious mango recipes. Kiwi is another fruit that is rich in vitamin C. It is known for ensuring good night sleep due to the high levels of serotonin it contains. Let your children enjoy Kiwi whole or in smoothies to benefit from it. We know that oranges have high level of vitamin C but most people don’t know that bell peppers or capsicums have more vitamin C then oranges. They are low in calorie and make a perfect snack for kids. Mix them in vegetables and fruit salads or steam them for children. It may take some time for your child to like its distinct taste but once they adapt to it, there is no stopping them. I hope the information mentioned above is useful for you to start treating your child with food that will help strengthen their immune system. Most of the food I have talked about are easily available and are eaten by us but we usually do not know its importance. Now that we know need to make sure to include them to our child’s daily diet without fail. Along with the foods there are other things that help the immune system of your child. As usual let me emphasis on the importance of breast milk. It is known that the children who are breast fed contract less infections in comparison to the formula fed babies. Breast milk is the pure form of feed you can give to your child which has no bacteria as it comes directly from the mother whereas bottled milk gets easily contaminated therefore it is advisable to breast feed your baby exclusively till 6 months of age. Breast milk benefits the child’s immune system and provides antibodies, immune factors, enzymes, and white blood cells that fight the infections in your baby’s body. There are some other things that a mother needs to keep in mind when it comes to the immune system and its strengthening. It’s important to avoid sugar or foods high in sugar as it reduces white blood cells. The white blood cells fight and destroy the bacteria that cause infection. Other thing to avoid is antibiotics. I understand that to see a child suffer is the worst thing for a mother as she wants to do whatever it takes to comfort the child. Doctors also feel pressured to prescribe medicines and antibiotics. Make sure you administer antibiotics only when it’s extremely necessary and under a doctor’s prescription. It is better to let the antibodies fight the bacteria and destroy it – to help the child build his immunity power. Don’t be scared of fevers. The fever is a sign that the body is fighting the disease. The body is raising the temperature to try and kill off the bacteria. The immune system in the body works much better in high temperature therefore not all fevers are bad. If the fever persists for more than 2 days and or rises above 103 degrees, it’s time to get it checked by a doctor. Another thing to help your child’s immune system is by safeguarding it. Try to keep the child germ free by washing their hands regularly especially before meals. Proper rest is also a way to help the immune system function better. A good night sleep and naps during the day helps the body to relax and work on itself. Make sure your baby takes good amount of rest to ensure its health. I would also like to talk about home remedies for cough and cold. Living in India we are fond of home remedies. I always suggest using home remedies before running to the doctor for general illness. Foods like honey, garlic, ginger and various spices act as good home remedies for cold, cough and runny nose. They cause no side effects and are easy to prepare at home. Last but not the least, a lot of love and care is needed for a child to stay happy and healthy. A well loved child and a secure child tends to fall sick lesser than a neglected child. Laugh and play with your child as it stimulates the immune system. I recommend massaging your child regularly to give that special motherly touch and a good night sleep for your baby. I really hope that this information helps you in taking care of your baby and keeping it away from infections.